POLLUTION & DANGEROUS CARGO are two of the major concerns for any industrial port city. Air and water do not recognize borders. 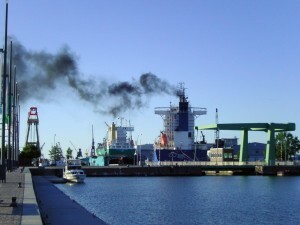 Marine ports in the United States are major sources of pollution for the surrounding regions. Enormous cargo tanker ships run on diesel fuel. This is the the dirtiest type of gasoline. The cargo ships leave their engines running to on and offload cargo to avoid paying docking fees. 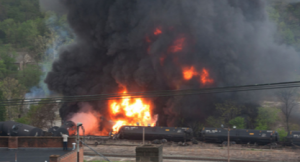 Now add the dangerous cargo of coal, pet coke and oil transported through ports along water, roads and rail. What happens in a accident? Once a Port is in Operation, It Could Transport Cargo We have Never Thought About. Who is to say NO? When Oakland granted the permit to developer Phil Tagami of Terminal Logistics Solutions for shipping bulk on the decommissioned site of the old Oakland Army Base, it never thought about coal. Read Oakland’s full story—it sounds just like what VMT wants to do in Vallejo. Let’s tell them no! 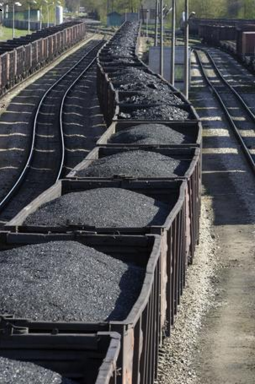 A Coal Terminal in Oakland? Once the port is in operation, there is no restriction on what will be transported through the port and the same by the rail through our city. It could be as safe as timber and rice, as polluting as coal and pet coal or as dangerous as radioactive waste and bio waste. 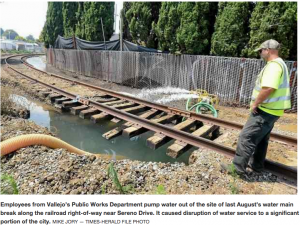 Benicia’s recent battle with Valero on crude by rail project is a perfect example of what big business can do. Also once the rail become part of the regular transportation system, the city lost control…also as shown in Benecia’s case.